Pre AVG: 1936-Kenosha, Wisconsin High School graduate. 1937-38-Civilian Conservation Corps 1939- U.S. Army Air Corps. 1940-Air Corps Technical School (Radio Operator and Mechanic) 39th Pursuit Squadron (Bell AirCobras) 31st Pursuit Group, Selfridge Field Michigan. Rank, Corporal. Honorable discharge June 14, 1941, to join American Volunteer Group. AVG Service: Left for Rangoon, Burma, July 11, 1941, aboard Java Pacific Line, the Jaegersfontaine. After arrival at Kydo Airdrome near Toungoo, Burma, was assigned to First Squadron and installed aircraft radios in our P-40 fighter planes. On November 4, 1941, our squadron left for Kunming, China in a convoy. My truck carried 50 caliber ammunition and arrived November 14, 1941. Was assigned to install an early warning radio station at Iliang, with a cook and interpreter. When rat bites became infected months later, returned to Kunming for treatment, and then was assigned to the Yunnanye station on the Burma Road until end of AVG contract. On July 4, 1942, left Kunming on China National Aviation Corp. aircraft, for Karachi and eventually Bombay, India, for Capetown, South Africa and the USA. 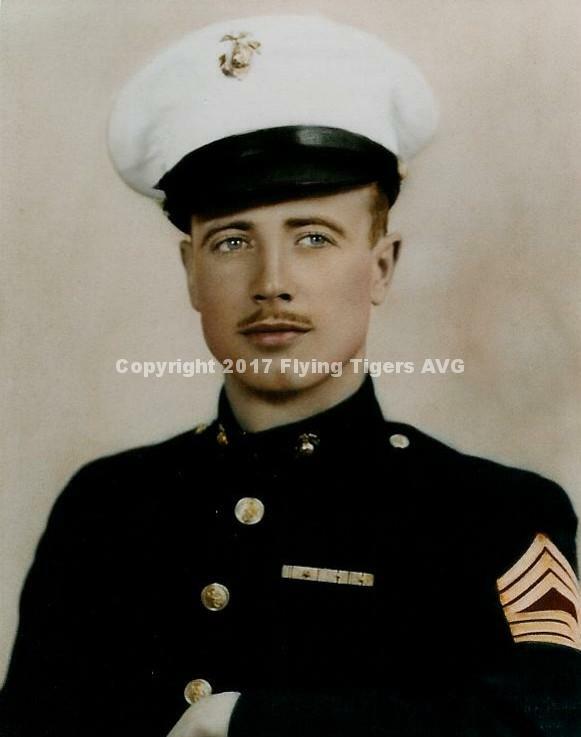 After sick leave for hepatitis, enlisted in U.S. Marine Corps, December 14, 1942. While at U.S. Marine Air Station, Cherry Point, NC, went on a War Bond Drive with Medal of Honor decorated Captain Joe Foss of the USMC. We flew to Naval and Marine air stations and visited several large cities nearby. Joined VMB-413, the first twin engine bomber in Marine Aviation which was a B-25 aircraft designated Marine PBJ. The squadron left by troop ship for Sterling Island in the Treasury group, from which VMB-413 engaged in radar night bombing of the Rabaul Air and Naval Bases. The squadron later moved for operations from Munda and Emiru Islands closer to Rabaul. In late 1944, returned to the US by way of the Admiralty Islands by troop ship. At El Toro Marine Air Station, was honorably discharged on September 27, 1945, as Master Tech Sergeant or Communications Chief. In October 1945, enrolled in Lawrence College in Appleton, WI. Earned a Bachelors degree in June 1949. For a short time, worked as an auto insurance investigator in Waukegan, IL. Secured a position with the US Civil Service at the Naval Electronics Supply Office in Great Lakes, IL. Later transferred to the US Air Force Materiel Command of the Civil Service at Dayton, OH. Was assigned as inspector of emergency radio assembly at Kingston Products in Kokomo, IN. Took a position in 1953 at Delco Radio of GM in Kokomo, as production and process engineer. The company later was known as Delco Electronics of General Motors. After 27 years, I retired in 1980 and live in Greentown, IN with wife Fleeta and daughter Susan.